Is it Live or is it Memento Mori? Two posts ago, in What I Discovered in the Box of Unscanned Remine Photos, I posted a photo of two girls circa 1870s or 1880s. One reader wondered if one of the girls could be deceased. She saw the wooden stand behind the girl. While I didn’t think this particular girl was deceased, and photographers mainly used stands behind people to help them hold still for the 15-20 minutes required to take the photo, it is true that photos of the dead, called Memento Mori, were quite common. In fact, I have a Pinterest board devoted to the subject. Of all the antique photos that I have in my collection, I don’t think I have any memento mori. Apparently, the style did not catch on with my relatives. By the beginning of the 20th century, most of the Victorian form of photographing the dead had (sorry) died out. However, there is one photo that sometimes I wonder about . . . . This particular photo might, in fact, be too late. The photographer was in business from at least 1899-1915. I found researched information on the site Bushwacking Genealogy. Dornbush, Henry G.: Lived 1878-1962. In business at least 1899-1915. Not a photographer in 1920 census. But maybe he was in business a bit before 1899. Or maybe this photo is from 1899 or 1900 and was on the tail end of the fashion. Why do I wonder about this photograph? Notice the rose the man is wearing. It is upside down. In the 19th century, flowers were a language between people. This photograph has the general feeling of a wedding portrait because of the flowers, but because his flower is upside down, it likely means he is in mourning. Notice how her body leans into and behind him, but is stiff in appearance. Her gaze is directed off somewhere, while he looks into the camera. I would like to identify this couple. It’s very possible they are on my family tree. Just in case she is deceased here, any ideas for how to compile a search on Ancestry of death dates? After all, I have a couple thousand people to sort through. What do you think? Is this photograph memento mori or can all the clues be explained away? No idea about the Ancestry search. Whether this is momento mori is pretty creepy to contemplate, but your observations make sense. Indeed this could be an example. Let’s hope this Victorian-era trend never makes a comeback! I can explain away the woman (differently abled, almost blind, etc. ), but the upside down flower seems very prominent and on purpose, don’t you think! I guess the fashion is still in style in some religions and cultures, but not so much in mainstream America, although with iPhones it might be making a comeback, photographing people in their open caskets. Yes, the upside-down flower was the tipping point for me. Thank you for the interest in my blog. It seems we were meant to find each other! Your knowledge and attention to detail have already taught me somethings and I look forward to learning more. It will be s great help in my project. Oh, thank you for saying that. 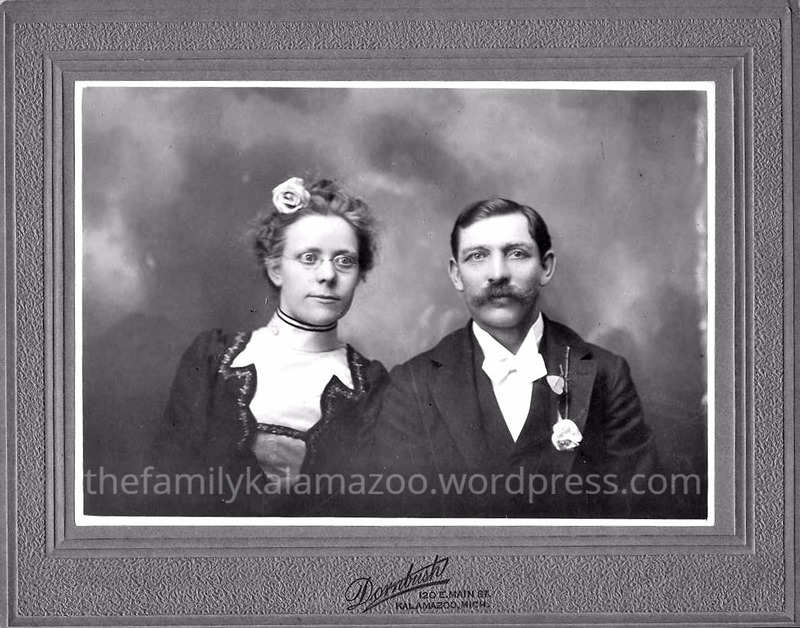 You know I have learned to pay more and more attention to detail in the old photos and documents from reading family history blogs and listening to readers who comment on my blog. I have learned so much from them! I have never heard of this practice before. I’ve heard of death masks, but photos of dead people? Yikes! Fascinating. The Jewish tradition of only using closed caskets kind of guards against this sort of thing at a funeral, so maybe it kept your relatives from engaging in photography of the dead! It’s super fascinating. And also the other ways the Victorians had of staying close to their dead. Read about all the mementoes they made with hair, etc. That’s right. It’s hard to “judge” someone else’s cultural values. And I can understand that when a Victorian lost a loved one and had no photos, why they would rush a photographer in. I think you are right about this being an example of memento mori. The upside down flower seems like a clear clue. I also found it interesting that the woman had a similar flower in her hair. Somehow the photo makes a sad event seem more real. . and I want to know the story. I wonder how she died. . . pneumonia? . . . another illness? . . . child birth? I also am intrigued by that rose on top of her head. What an odd placement. Plus, my relatives just didn’t use flowers in photos that I can think of. At least not before the 20s. Also, notice how her glasses are strange on the right side of her face (our left). It almost looks as if her eyes are painted on, which was a customary practice of memento mori photography. Barb, it’s all so uncertain. But it was quite common for the living to pose with the dead, not just cut out and superimposed. Look really close at her eyes and glasses. The right side of her face (our left) looks odd, as if when they painted on her eyes (very common practice) they messed up the glasses frame on that side. It could be mourning a child, but the woman looks so odd for several reasons. I had never heard of memento mori before. More like memento morbid to me. Sorry. I have a photograph taken of my uncle (my father’s only brother) while in his casket who died in 1946. That’s not the way I wish to remember people. But back to your photo, I can’t help. I’ve seen a couple of those from the 40s, too. I don’t know if it was because of the war or what, but after not seeing much in the 20s and 30s, there seem to be some in the 40s. But maybe that’s a coincidence, not sure. Actually it does help, Paula, because it brings home how young Dornbush was and also prompted me to search to see if he was the only Henry Dornbush (he wasn’t, but he was the photographer). Makes it less persuasive that it’s memento mori because it must be around 1900. But still . . . . I think you need to consult an expert. Would the smithsonian be able to advise? You’re right. I wonder if I should first try a genealogy photograph expert. I used one once before. I could try her and see if she has experience with memento mori. There is a blogger who writes about funerals and cemeteries almost exclusively. I ought to ask her. This was really fascinating. Thank you for sharing such an interesting article. We see things so differently today. Sweep stuff under the rug, really. Fascinating, Luanne. I had no idea about the symbolism of the upside down flower. Chilling! I have seen a few death masks (of Sacco and Vanzetti for example) and they are equally chilling. Patti, it is very chilling. I find it particularly so when they propped up the body so it would appear alive. As you said, we tend to sweep death under the rug today, and think memento mori photos are gruesome, but until the advent of antibiotics, death was a constant companion. People didn’t die in hospitals; they died at home, and were laid out there. The body was washed and decently dressed, and arranged in proper fashion. Somebody – usually a church – would have a cooling table, a long, narrow table with a cane top, where the deceased was placed until it has reached room temperature and rigor mortis had set in. In the meantime, a casket would have been ordered and delivered, and once the deceased was in the coffin, the cooling table would be returned to the church, and the coffin set up in the front room of the house. Down south, the custom of taking “one last family photo” still exists. The Squire’s stepfather was buried from a funeral home, and his wife and all the kids gathered around the coffin. We have a friend, and Episcopal priest, who tells us that one family decided at the very last minute they wanted a photo, so at the cemetery they opened the casket and stood it up on end – where upon Uncle Jake began to s-l-o-w-l-y slide down into a sitting position. And then his head flopped forward! These are the things they never teach you about in seminary! What a wonderful description of the process! I can just imagine and it must have been so emotionally exhausting for all and yet still more tangible than the way we tend to do things today. Your story about Uncle Jake is astonishing! Such a great story!! !